Early in 2018, the council members for the city of Waukee, Iowa, approved Phase IV of a capital improvement project allowing for the expansion and enhancement of the Northwest Area Trunk Sewer Extension. This phase included more than 7,000 linear ft of 24-in.-diameter sanitary sewer in an open-cut method, excavation and backfill along with surface restoration and other miscellaneous associated work. Upon the approval of the improvement project, the city began accepting proposals and ultimately awarded the project to J&K Contracting LLC. The duration of the work was critical to the project in order to minimize the disruption associated with the construction and the negative impact to the surrounding community. The truncated timeline combined with the relatively high fills required for the project were somewhat challenging. J&K Contracting ultimately selected A-2000 PVC manufactured by Contech Engineered Solutions as the solution for the project. This product was reviewed and approved by the consulting engineer, Veenstra & Kim Inc., who wanted to ensure that the selected product would be able to withstand the necessary 40-ft cover. A-2000 PVC offers strength and joint tightness, and it is proven as a cost-effective solution to other options. Engineered for gravity flow applications in depths exceeding 30 ft, it is suitable for use as sewer pipe, providing material stiffness up to six times greater than high-density polyethylene, with a 46-psi rating for all diameters. After the pipe was delivered directly to the construction site, J&K Contracting laid and joined the entire 7,224 linear ft of 24-in. 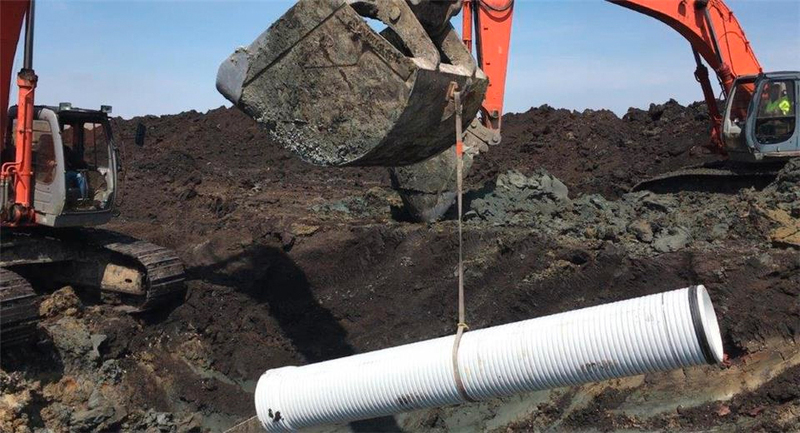 A-2000 trunk line within the tight construction timeframe, utilizing light equipment to complete installation prior to backfilling.